Low-fee Southwest rewards. For a $69 annual fee, cardholders earn a one-time bonus of 40,000 points after spending $1,000 in the first 3 months, and a 3,000-point anniversary bonus. 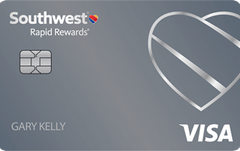 This is one of several Southwest credit cards included in our list of the best airline credit cards. Our take: Frequent Southwest fliers and anyone planning a big vacation in the coming months will benefit most from the Southwest Rapid Rewards Plus card, but would-be jet-setters should be wary of limited options for global travel.